My research focuses on understanding and investigating wildlife associations with habitat and specifically, responses to habitat fragmentation. 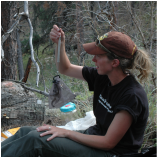 I use both applied and theoretical approaches to study wildlife ecology including a variety of field methods, stable isotope analysis, respirometry, measurements of fine-scale movements and perceptual range, and modeling. I place a strong emphasis on making connections between scientific research and management and whenever possible, work with both federal and state agencies to incorporate my findings into adaptive management plans.